196 participants from 15 different nations battled for medals in 13 categories. The nation with the most gold medals was Czech Republic, with gold in the following Open Division, Open Double, Female single and Female U18. 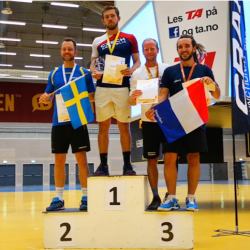 The tournament was played on 15 crossminton courts, all under the same roof in a big handball arena at Skien Fritidspark, the greatest area for sport facilities in all of Norway. Most of the players used the Accommodation At Fritidsparken hotel, just 100 meters away from the courts.